Biokleen Laundry Liquid seems to offer great cleaning with no chemical ingredients. In fact, all of the ingredients that they have here are plant based. Pair that with a bunch of great cleaning claims like "tough on dirt", and it looks like you got yourself a great product. However, does it live up to what they claim? Let's break it down. There are some good options to choose from when you are shopping for laundry detergent. There are good natural options, some cheap chemical laden options, and some options that just do not work. Biokleen Laundry Liquid is a totally natural, liquid laundry detergent. These work great with water, especially in cold water. Not to mention you can also use these to pre-treat stains on clothing. However, the limitation with liquid detergents is that they can be easily overused, not to mention that their packaging creates more waste. Now, there are a few surfactant, however like I said before, they are not made from chemicals. Instead, they are derived from plants. Unbeknownst to many people, many chemical additives like sulfates and glycerin are originally derived from plants. However, companies choose to create them artificially using chemicals because it is cheaper. While a scent is not particularly needed when it comes to laundry detergents, it is definitely welcome. Many people believe that if your clothes do not come out smelling like flowers or citrus, that means they are not clean. This is not true in the least, but because it has been ingrained in our minds for so long, it is still a good idea to use a fragrance in your detergent, from a business standpoint. So, Biokleen Laundry Liquid went with a citrus scent, but got the smell from natural sources, that have no potential risks for you. The best thing about this detergent is that it is completely free of any and all chemicals. Biokleen Laundry Liquid contains no phosphate, chlorine, ammonia, petroleum solvents, butyl, glycol ether, metasilicate, brighteners, SLES or EDTA. There is nothing to worry about in terms of potential health risks. Biokleen Laundry Liquid allows you to take advantage of all of the benefits that come with standard laundry detergents, but without the potential health risks. You still get the surfactants and the fragrance, except everything is plant based, instead of loaded with chemicals. This is great because many people are used to the way regular detergents work and switching to a totally natural detergent can be a bit weird. Luckily, this is as close to standard detergents as a natural product can get. While the conversion to natural is a great factor, often times the packaging itself seems to be problematic. There have been a few reviews for this product that have mentioned an issue with the bottle coming broken. Because this is a liquid detergent, a broken bottle doesn't only mean a big mess, it also means a lot of the product could be lost. As with many natural detergents, the scent is often an issue. This is because in general, people are used to the fresh flower or citrus scent of clean clothes. Often times, that scent is simply masking the dirty smells of your clothes. But still, people generally assume if a piece of clothing smells nice, it must be clean. For that reason, a scent has been added to Biokleen Laundry Liquid, however it is not nearly as strong as regular detergents. Because of this, many people have complained that their clothes do not smell clean. But do not be fooled, just because they smell like cloth or hint of "dirt", does not mean they are dirty. That is just how clothes smell normally. Since 1989, Biokleen has been making natural cleaning products that are free of harsh chemicals. The company is family run and owned, starting with the first generation with Jim Rimer, and now with Cindy Rimer and Barry Firth. Together as a family, they continuously strive to improve their products and develop new ones. Now, their product line is quite expansive, having products available for all parts of the house, including pets. Biokleen Laundry Liquid is natural and safe. When you use Charlie’s Soap, you won’t be adding harmful chemicals to the environment or your septic tank. Switching from a standard laundry detergent to a natural one will be easy with this brand. Charlie’s Soap – Fragrance Free Powdered Laundry Detergent is a product that has been around for a long time because it works. The poor packaging can break in transit leaving you with a big mess. While other products make your clothes smell flowery or like an ocean breeze, Biokleen Laundry Liquid has a scent, but it is not nearly as strong as others. Plant based SLS still has the chance to be contaminated and to be processed with chemicals. Even though the surfactants are plant based, there is still a chance that the processing put it in contact with other chemicals. If you are looking to get completely away from chemicals in every way, shape, and form, you may want to avoid this brand. However, if you are looking for a great brand to help you transition from a regular brand to a more natural one, this is definitely the brand for you. Overall, Biokleen Laundry Liquid is not a horrible brand. While it does have a few drawbacks, it could be a great brand to help those who are used to regular detergents change over to a natural product. This detergent will make it a whole lot easier for you. If you want to try it out for yourself, you can grab a 64 oz bottle on Amazon for $17.69. For any other information, especially the best natural laundry detergent, check out the rest of Green and Growing. 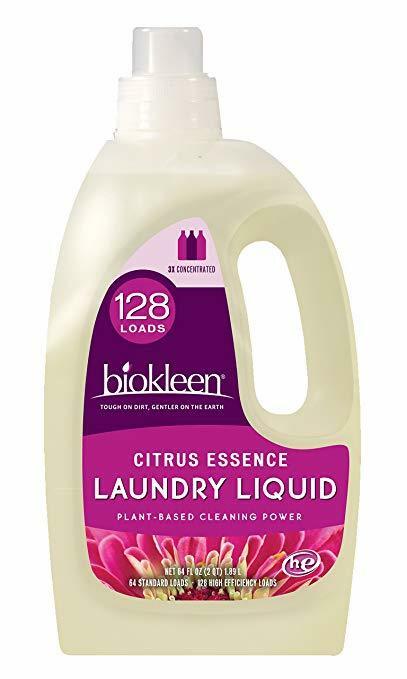 Here are some top questions that I found for people seriously considering buying the Biokleen Laundry Liquid, Citrus Essence. Why do I see suds? Yes, Biokleen Laundry Liquid features plant based surfactants that will foam up like regular detergents. Does this have a strong scent? No. It does have a light, citrusy scent, but it is not overpowering and you may not even notice.